So far this month we have had a variety of art and artists leading us into deeper reflection on spirituality. But today I’d like to delve more deeply into the way in which art can be therapeutic for both the artist and the spectator. And Veronica Brady also uses that term ‘open’ when she says that “Genuine spirituality, like art, is open and dynamic...both are the hope of a world so badly in need of transformation” (http://www.ru.org/81brady.html). I’ve quoted artists about how they make themselves vulnerable and open, but of course there are two sides to any piece of art, the one who creates it and the one who beholds it. It can be transformative for both artist and spectator. I was searching for a few examples of artists through whose work we could explore receptivity today, and I have found three very different ones who come from our own faith tradition. In many ways, perhaps incidentally or deliberately, our fourth principle – a free and responsible search for truth and meaning – and our seventh principle – our part in the interdependent web of all existence – play significant roles in their creative genius. First, the very successful work in the 1830s of a lithographer whose name is usually linked with another – Unitarian Nathaniel Currier, who along with James Merritt Ives produced the kinds of pictures that come to mind in the song “Sleigh Bells”, where the lovely weather for a sleigh ride together with you is like a picture print of Currier and Ives. 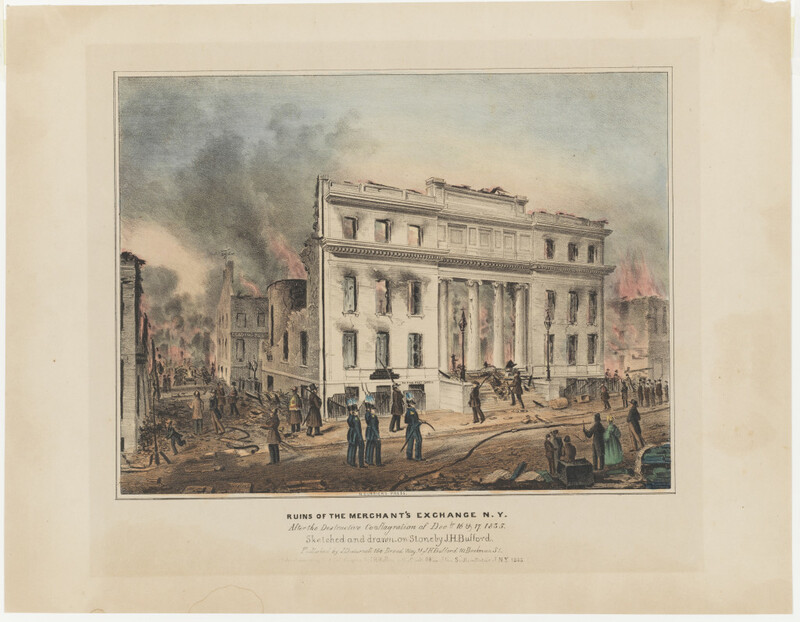 And so one of his first pictures which drew the American people’s attention to life in an urban environment – as people flocked to fast-growing cities – is “Ruins of the Merchant’s Exchange N.Y. after the Destructive Conflagration of Decbr. 16 & 17, 1835." This lithograph was issued initially in black and white and later in a hand-colored version—and appeared within days of the fire, selling thousands of copies”. 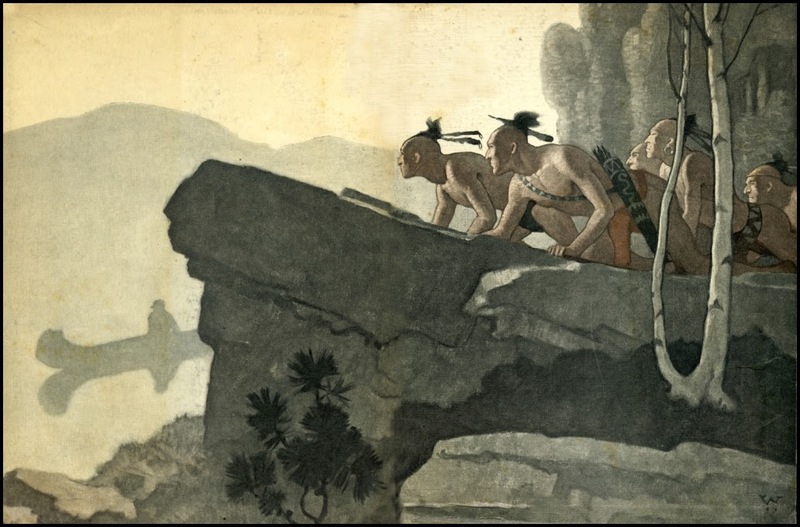 Shepley says that one message to which the spectator of this image might be receptive is one of self-discipline, in the depiction of sober, proper behavior by onlookers and workers in the face of crisis. Many young people in particular, who were noew to city life, would see this picture and understand and internalize the norms of reaction to such disasters. 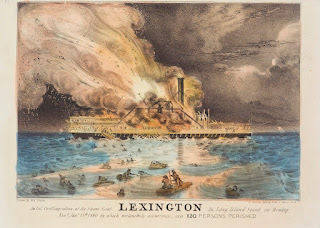 “Five years later Nathaniel Currier’s lithographic print Awful Conflagration of the Steam Boat Lexington in Long Island Sound on Monday Eveg, Jany 13th 1840, by which Melancholy Occurrence, over 100 Persons Perished," "appeared in record time after the disaster and was delivered through the uncommon distribution mode of a news extra.” Its appeal to the spectator is one we all can identify with, the desire to see a sensational event safely from a distance. It puts the spectator farther away from the ship and closer to the desperate passengers who are in the water. Shepley explains that attraction to sensationalism of spectators at the time was "due to Victorian attitudes toward death and dying. Americans were preoccupied with their bodies and their souls in this period, as shown by many songs, poems, sermons, and novels about death and how to deal with it" that flooded the consumer market. 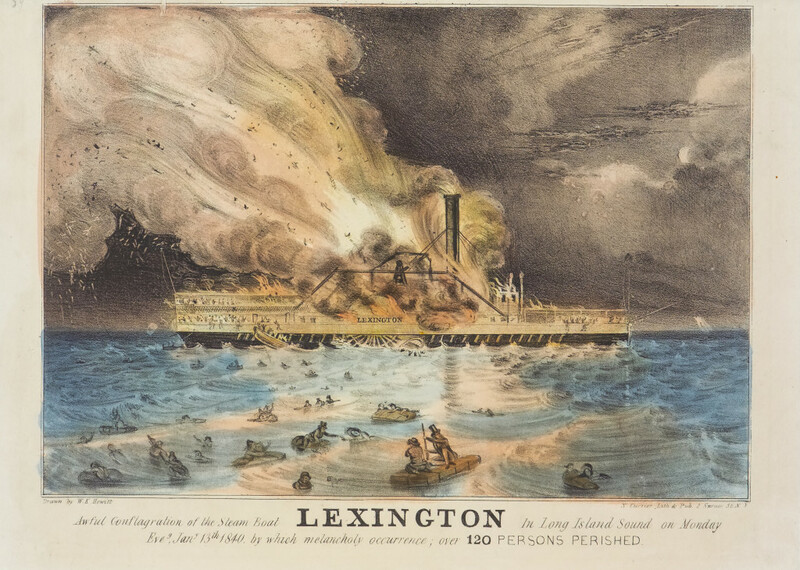 And so Currier’s picture of the wreck of the Lexington , and that of an earlier shipwreck, "The Dreadful Wreck of the Mexico on Hempstead Beach. Jany. 2nd 1837," may have served as an image for "remembering not only the life and death of its victims, but the life and death of the viewer." The nation was changing at such a rapid rate that the insecurities Americans faced were stoked by these images. However, Shepley says that “These same Americans evinced a stubborn faith in progress and oft-professed determination to overcome adversity”, and the images from his lithographs gave voice to their “fears, ideals, and even secret pleasures.” This statement made me think about those voices that Thomas Kelly described as competing for our attention…the receptivity of those Americans who viewed those disaster scenes with curiosity, fear, horror, who were living in times they’d never imagined, where change came fast and furious – kind of like ours in the 21st century. And this example made me wonder about what we now use art for and I think we have the same need as those people moving into cities and trying to comprehend this new landscape; when we use – and create - social media images, the new art on Instagram and the photos we post, where we color in or insert our faces into another background, or post yet another video of cats – are we not in some way trying to make sense of our lives? Somewhat in awe of how amazing life is and trying to keep up and learn to adapt. Not so different from Currier’s devoted spectators. His son Andrew Wyeth was born exactly 100 years to the day after the birth of Henry David Thoreau, who N.C. Wyeth considered his hero. 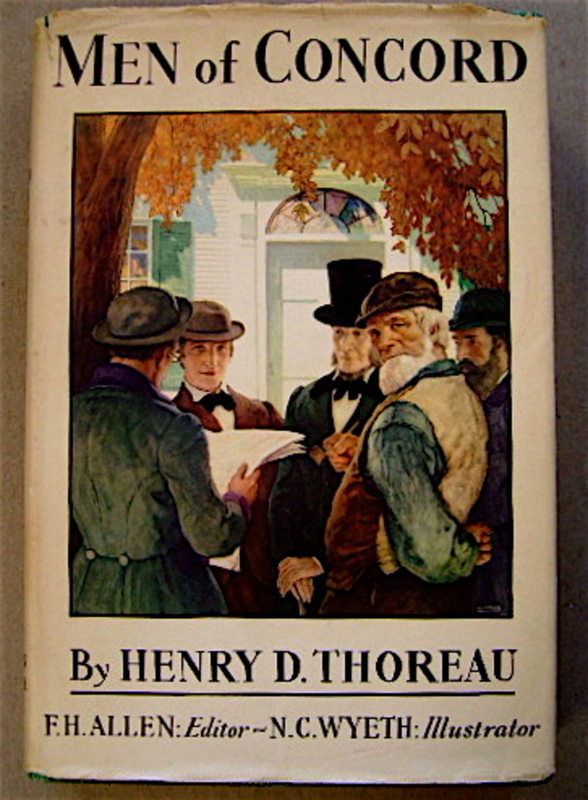 It’s said that his wife Carolyn caused him to reassess Thoreau, who he initially described as just another ‘amateur naturalist’. 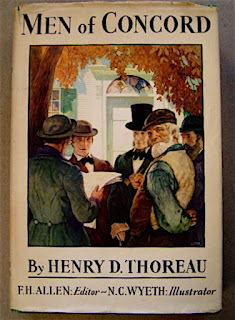 "His long-held wish to publish an anthology of Thoreau’s writings finally came true in 1936 as the illustrated Men of Concord and Some Others, as Portrayed in the Journal of Henry David Thoreau, edited by Francis H. Allen." 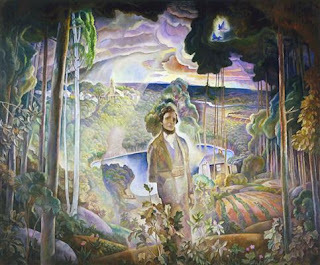 Wyeth's admiration for Thoreau is most visible in this painting from 1933, "Walden Pond revisited," so unlike his other lifelike illustrations. 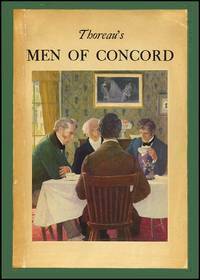 Its details include Thoreau’s beanfield, the pond, the railroad, the Unitarian Church steeple, and the town of Concord. 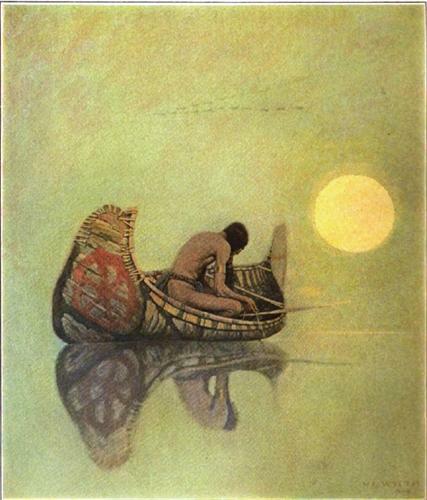 Anyone who grew up looking at wonderful illustrations from The Deerslayer, Kidnapped or Robinson Crusoe will no doubt remember the awe those pictures inspired, and how they helped to imprint the images of those stories in our memories. 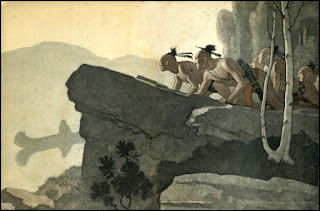 And finally we come to another illustrator of children’s books who is much beloved in the memories of adults, and who, like Wyeth, cares about the natural world and also what we humans do to it: Theodore Geisel (DR Seuss). 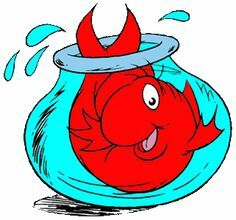 This congregation has benefitted from the sermons of Dr Greg Brock about Dr Seuss, and the messages of his art and stories which resonate with the Unitarian Universalist imagination and reflect its values. His art is concerned with human behavior but through the weirdest non-human characters! 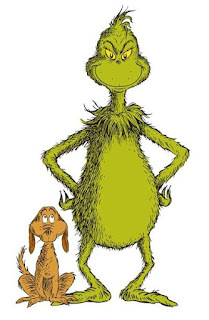 The Sneetches, which we saw earlier, tells us that “race and ethnicity need not be dividing lines in our society, and that we can coexist peacefully, regardless of our external differences.” (www. seussville.com) It was published in 1961 and its message is still as needed as ever. One of the favorite stories is The Lorax, which Dr Seuss called a cautionary tale, about the interconnectedness of the things that live in an ecosystem. We can pretty much sum up its moral in this warning from the Lorax himself: "Unless someone like you cares a whole awful lot, nothing is going to get better. It's not." 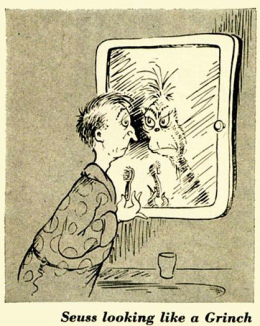 Geisel never claimed to know what inspired him in the creation of his stories and characters – just like the quote earlier, he plumbed the unknown depths of his imagination – but he did base 2 of his characters on himself: the Cat in the Hat and the Grinch. 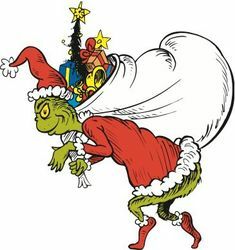 And it is his explanation of the origin of How the Grinch Stole Christmas that I’d like to share with you. We can see in these examples today how the mysteries of the human condition, both good and bad, inspire artists in their work, and give us greater insight into what it means to be human and what we can learn from being human. In doing this as Erna Cooper says, "Art is an equalizer of the high and low in society, a medium through which all of us may share the same subjective sphere, linking what was formerly the ‘worthy’ and ‘unworthy’ and erasing the boundaries between us." A final quote from Veronica Brady: "Art reminds us that life is stranger, more beautiful, demanding, joyous and painful than common sense knows."